There are a LOT of different ways to run literacy centers. For example, you can have students work in pairs. Or they can work in larger groups. You might have students work with their guided reading groupmates. Or mix groups up so that students work with peers at different levels. You can let students choose centers. You can give them partial choice. Or you can determine the centers that students visit. 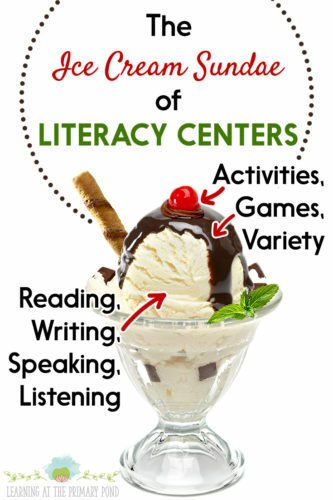 So is there one “right” way to implement literacy centers? I really don’t think so. Ultimately, you have to do what works best for you and your kids. But in this post, I’ll share the framework that makes the most sense to me! I’ll cover topics like grouping, differentiating, and holding students accountable. AND I have a free gift for you at the end of the post!! 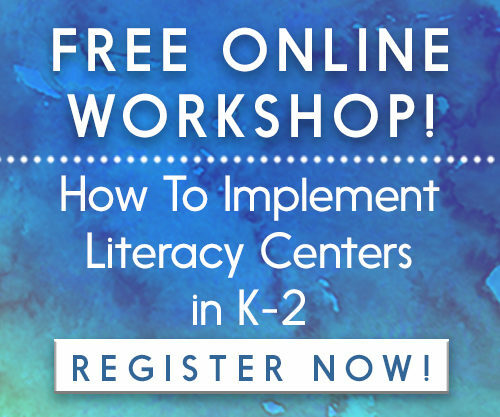 What is the “Literacy Centers That Work” framework? 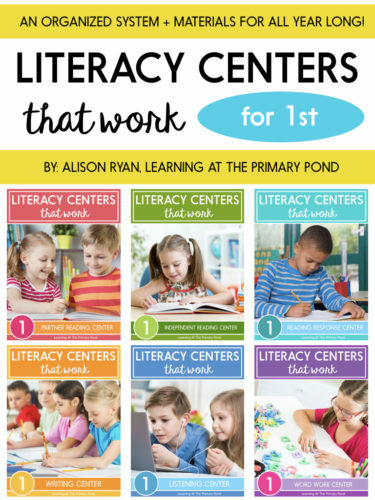 My “Literacy Centers That Work” model is structured around 6-7 work centers that students visit while the teacher meets with guided reading or other literacy small groups. Reading, writing, speaking, and listening are the foundations of the centers activities in this framework. Think of it as an ice cream sundae. Reading, writing, speaking, and listening are the ice cream (necessary for the sundae!). The different variations and activities are the toppings (fun and make the sundae taste even better). This framework also reflects the principle that students need meaningful, authentic practice to grow as readers and writers. Centers activities are derived from and tied closely to whole and small group literacy instruction. What are the different centers? I suggest that you tell students which centers they will go to, and when. Students have choice within each center—but more about that later. I also recommend that you use this same order of centers (1-6, or 1-7) in the rotation. For example, Group A visits centers 1-3 on Monday and 4-6 on Tuesday. The order of these centers was carefully selected so that students usually have a balance of writing and reading activities each day. This center is all about reading, plain and simple! It’s a quiet center—but not necessarily silent, since many students in K-2 may be whisper reading. 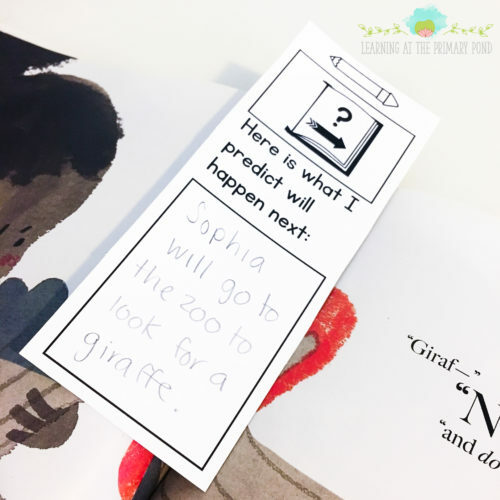 In the independent reading center, students may jot down thoughts, reactions, and questions on sticky notes, half-sheets, or on interactive bookmarks (pictured below). They write quick notes or ideas to share with their peers. However, at this center, students don’t spend time on lengthy written responses (or drawings). That takes place at the “Reading Response” center. Why? Because kids need plenty of time to just read. If we ask them to create lengthy responses during their reading time, it can a) reduce the amount of time they have to practice reading, and b) send confusing messages about whether they need to be reading or writing. Also, students bring their own book bags or book boxes to this center. They usually read only from their own book bags or boxes. Kindergarten and early first grade students should have 10-12 books in their bags/boxes. Late first grade and second grade students might have between 6 and 8 books, depending on the length of texts that they are reading. I also think it’s important to ensure that students have at least some books in their bags that you know are at their independent level. I typically create a book shopping rule like, “Select 5 books from anywhere in the classroom library, and 5 books from your group’s bin.” Inside the group bin, I can put a) books that students have already read during guided reading and b) other books that I know will be at their independent level. This combination strategy allows students choice. But it also helps ensure that they’re not always reading books that are way too hard or way too easy. And speaking of book shopping, the independent reading center is not an opportunity to shop for books. This time is exclusively dedicated to reading. They can shop for books during other “down times” in the day. I like to assign each guided reading group a book shopping day (or days), and students get new books as soon as they arrive at school on that specified day or days. That said, kindergarten and early first grade students tend to go through books quickly—and if your centers last 15 minutes, that can be a long time for them to read independently! For these students, place a 5-minute sand timer in the center. When students arrive, they turn the timer over and have 5 minutes to “shop” for new books in the classroom library. When the timer runs out, they must settle down and begin reading immediately. In addition to “regular” books, students can also read poetry, song lyrics, magazines, books written by other classmates, ebooks, etc. One final note: In addition to the independent reading center, I also dedicate another time of the day for students to read independently (even if it’s just an additional 5-10 minutes). Not all students will visit the independent reading center each day, but we want to ensure that all students have an opportunity to read independently every day. This separate independent reading time gives me a chance to meet with a few students for individual reading conferences and make sure that they are picking appropriate books for their bags. Also, I’ve found that some students focus better when everyone is reading at the same time, and the class is quieter. This center provides opportunities for students to respond to what they read in Center #1 (independent reading). A sand timer may be helpful with teaching students to limit the amount of time they spend planning and talking. A group leader might turn over a 3 or 5 minute sand timer as soon as students enter the center. When the timer runs out, planning and talking stops and students begin working on their responses. Typically, students will have 2-3 different options for how they respond to text. The options may vary, but can include: drawing or writing about a favorite part, drawing or writing to show an interesting fact, designing a new cover for the book, writing an alternative ending to the story, creating a new nonfiction book that combines information from several texts, answering a reader response question, writing a book recommendation for a friend, writing a letter to the author, etc. A response may not necessarily be finished in one day. Students may be finishing up a response from a previous day (I recommend that students spend no more than 2 days on any one response). Students store their unfinished or finished responses in their independent work folders, which they bring with them to all centers. In the word work center, students practice reading, making, and writing words they are learning. These can include sight words, words with a particular pattern, and/or vocabulary words (depending upon students’ levels). There are many different ways that you can organize this center. My personal preference is to have students work independently or in similar-ability partnerings. They practice their own words, which are kept on cards or in lists in their independent work folders. Words are selected for students based on their developmental needs, and they may be part of a word study program like Words Their Way (my personal favorite). 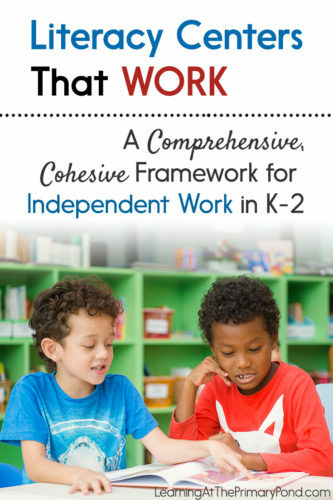 In kindergarten (or even early first grade), the word work center can start out with name work, alphabet letter/sound work, and phonological awareness work. 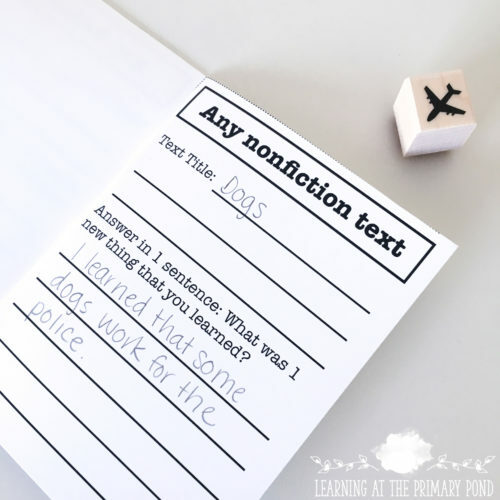 You may also want to include 2 word study centers in your classroom at the beginning of the year so that students have many opportunities to practice these foundational skills. In late first grade or second grade, the word work center may include grammar and vocabulary work. There are many, many possibilities for word work activities! Students can play games, stamp words, make words out of Wikki Stix or playdough, use iPad apps, work with magnetic letters, complete word or picture sorts, and the list goes on. I recommend limiting students to 2-3 choices at any given time. I also recommend teaching students a core group of games and having them play these games throughout the year (using different words each week or 2-week period). This cuts down on the amount of time you have to spend preparing and teaching games. In this center, students listen to pre-recorded stories or texts read aloud. They may also respond to the texts by writing, drawing, or talking to a partner. When I first started teaching, I had cassette tapes for the listening center. 🙂 But now there are so many different options! You might use a CD player (with a headphone splitter so multiple students can listen). You could also use desktop computers, laptops, or tablets to have students listen to books online or in apps. Students place finished work in their independent work folders, or leave it at the center if the audience of the work was their classmates. In the writing center, students choose from a variety of writing tools and can work on different writing products. Students store their writing in their independent work folders so that they can easily return to it later. However, if they choose to work on a piece from writing workshop, they put that piece back in their separate folder for writing time. In the partner reading center, students work together to read and discuss texts in a variety of ways. I know that not all of us work in a school where the arts, drama, and play are prioritized. But if you are able to create a center like this, I think it’s a great idea to do so! There are so many possibilities for this center! When I taught kindergarten, I always created a space for dramatic play in my classroom. If you’re interested in resources to help you create a dramatic play center based around literacy, look for my dramatic play resource (coming soon!). I like using these 6-7 essential centers for simplicity and ease of planning. However, if you prefer to have a greater number of centers, you can “break up” the different activities in these centers to make more centers. For example, instead of having students read big books during partner reading, you can have them read “regular books” during partner reading and establish a separate big book station. Or, instead of having students work with technology in the word work and writing centers, you might have a separate computer or iPad center. 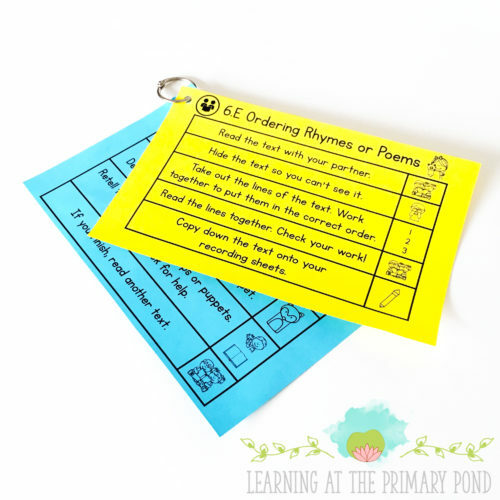 You could also add separate poetry centers, pocket chart centers, or fluency centers. And you may need to break up these centers if you have a large number of students—but more about group sizes in a minute. How long do centers last? This depends upon a lot of things—where you are in your school year, what grade level you teach, how long your literacy block is, and how many small groups or guided reading groups you want to see. Generally speaking, you probably want to have students spend 30-45 minutes TOTAL in centers each day. Each center can last about 15 minutes for K-1. In 2nd grade and up, you might use 15-20 minutes for each center. How do students rotate between centers? In my model, the teacher assigns students to centers. Each student visits 2-3 centers per day (fewer if he/she is seen by the teacher for guided reading). Each center lasts as long as one small group lesson, so all students rotate at the same time. When it’s time to clean up, the teacher gives some kind of signal. When students are finished cleaning up, they sit back down and point to the center where they will go next. When everyone is ready, the teacher gives another signal, and students rotate. So that students are aware of how long they have to work in each center, it’s helpful to use some kind of visual timer (on the interactive white board, a sand timer, a timer with a large display, etc.). Also, teachers need to create some kind of display so that students know which centers they will be visiting that day. The display can be created on a pocket chart, bulletin board, or interactive white board. The teacher (or a student helper) changes the parts of the display each day to reflect students’ center assignments for that day. Ideally, 4 students work in a center at one time. However, in many centers, students actually complete the activity with one partner or independently. So although 4 students may be in the center at the same time, all 4 children are not usually working together (this helps reduce the noise level). Each group of 4 students consists of 2 students from one guided reading group and 2 students from a different guided reading group. This way, the teacher can specify that students work with a same-ability partner OR a different-ability partner, depending upon the activity. This set-up is also helpful because when a teacher meets with one guided reading group, there are still 2 children left in the center who can work together. You can read more about this strategy (and see some videos) in this post. How are centers activities differentiated? Many of the activities are accessible to all learners because students are reading and writing at their own levels. How are students held accountable for their work? First, I want to say that although I think it’s very important that students are on-task and learning during centers, I am not a huge fan of assigning students tons of worksheets. I don’t think that kids have to produce something in every center that they visit. How is choice incorporated into centers? Choice is a powerful motivator! Although I assign groups and the centers where students work, I like to provide different options to students within each center. I only provide a few choices at a time so that students don’t get overwhelmed (and to make centers easier to clean up!). How are materials organized and rotated? Each center has a designated location in the classroom. You can store materials and have students work in that same space. If you have a small classroom or other space challenges, you may have to have students work at desks or tables for some centers. You can still designate one location in the classroom where materials for that center will consistently be stored. In the past, I changed out all of my centers on Mondays. But I found that this created “information overload” for my students when I had to teach them (or at least review) tons of new centers each week. Instead, I recommend changing out only 1 activity option for 1-2 centers per day. So on Monday you might introduce a new activity for the listening center (and the other 2 options in that center stay the same). And on Tuesday, you introduce a new activity for the partner reading center (again, the other 2 options in that center stay the same). And on Wednesday, you might introduce new activities for the independent reading and word work centers. (And so on.) This way, you’re only spending a few minutes teaching 1-2 things before students start centers each day. Also, before you ever introduce a center, you should model it repeatedly in whole group or small group. For example, have students play a word work game during guided reading before you place it in the center. Because your centers activities should be closely tied to your classroom instruction, model them during different times of the day. When it’s time for centers, you might have to briefly review or explain a few things, but then it’s just a matter of placing the familiar materials in the center for students to use. In addition to the centers materials you set up, students also have their own independent work folders. You can have students keep differentiated tasks, word lists, or word cards in their folders for use during centers. Students also keep their writing, drawing, and other center-related tasks inside the folders. If a product is “in progress,” it goes in the pocket with the green sticker. If it is finished, it goes in the red pocket. 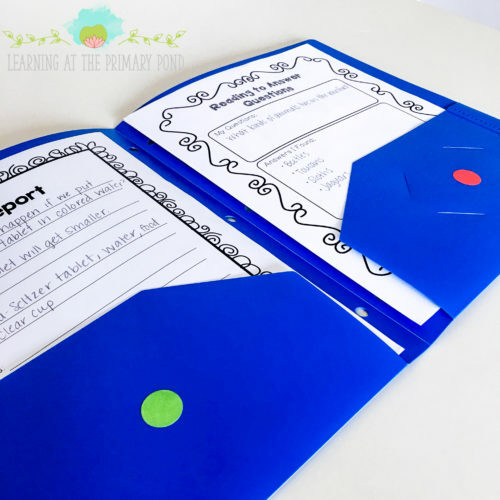 You can review students’ independent work folders on a weekly basis. After you’ve reviewed some of a child’s finished work, you can a) paperclip finished work to indicate that the child can take it home or b) place it in the child’s mailbox / other location for take-home papers. How do centers fit into the literacy block or school day as a whole? What if I need resources for my literacy centers? I’ve got you covered! If creating engaging, meaningful centers for your K-2 students is important to you – and you don’t want to stay after school for hours and hours preparing materials, check out my Kindergarten, first grade, and second grade literacy center bundles. You can also view the individual centers packs by scrolling down to the bottom of each bundle description. Let me know if you have any questions, and happy teaching! Is the passport activity above available yet or can we expect that on the 14th? I enjoyed reading your post and will be attending the webinar tonight. Did you say there is a free gift attached to this post? I apologize but my tired eyes can’t find it (or was it only available on the day of your posting)? In “Literacy Centers That Work,” I like how your 7 Centers give strong directions but allow for a lot of flexibility. I especially tuned into Word Work (for sight words and words with a particular pattern) and Listening Centers (Pre-recorded stories). 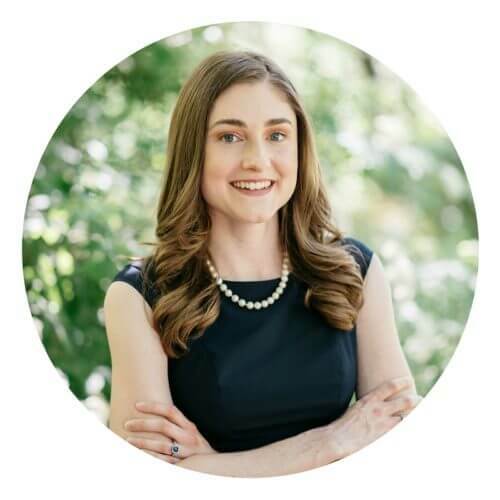 I am newly teaching second grade after seven years in the preschool classroom. I love a lot of these ideas! This was a very helpful post! I am anxious to try some of your ideas! Amazing information on using centers and giving choice in my classroom. Thank you for the suggestions and explanation of each center. I especially like how you set up your Centers with the intent of using partners. The guided reading grouping vs. center groups make so much sense to me! I like the idea of using mixed abilities in the centers and similar abilities in guided reading. Thank you for sharing. Do you have any ideas for displaying the center rotation chart? Perfect, thanks for the ideas! Where do they store their folders? It seems like the folders would be hard to keep up with? When do they clean them out? I love your analogy of using an ice cream sundae for your literacy centers! I run literacy work stations in my upper elementary classroom and can relate to this model for launching centers that actually work. Thanks for sharing your tips!